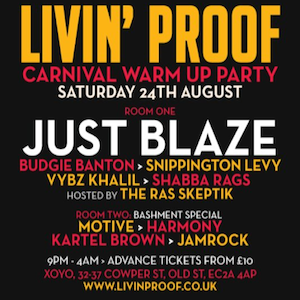 Livin' Proof has been a staple part of the hip-hop scene in London for some time now. Since its inception in 2007, the night has grown bigger and bigger, from a free party with 100 people in a small room, to selling thousands of tickets at some of London's biggest clubs. One thing that Livin' Proof have done consistently is draw in new fans whilst still keeping the friendly, family-like vibe of the night alive, as well as bringing through special guests such as A$AP Rocky, Dom Kennedy and Hudson Mohawke. It's been quite a year for the London crew who, aside from throwing some of the best parties London has to offer, have also hosted a number of live performances from the likes of Flatbush Zombies, Just Blaze and Danny Brown amongst many more. This weekend they celebrate their sixth birthday, and what a party it's going to be! The hip-hop drenched night, taking place in Shoreditch, London, will feature all four of the Livin' Proof resident DJs, Budgie, Khalil, Rags and Snips, alongside host emcee The Last Skeptik. If the night goes like how previous Livin' Proof parties, then it's bound to be a night to remember.